Are you ready to roll up your sleeves and get to work my friends? 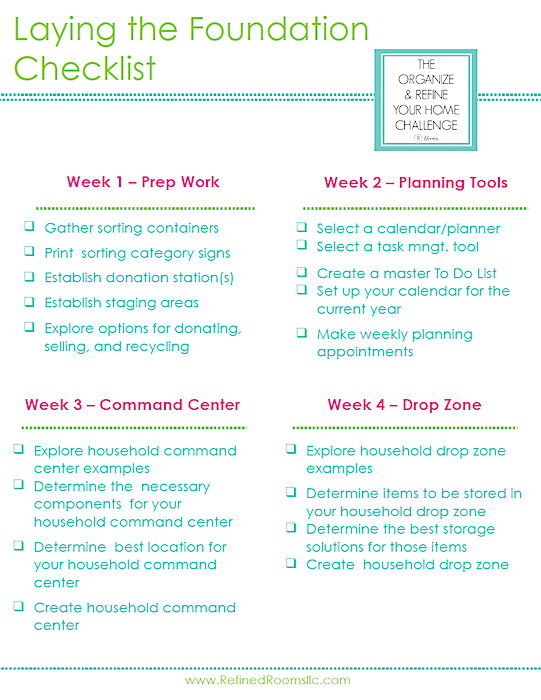 Today, we kick off the Organize & Refine your Home Challenge! We’ll start by laying down a solid foundation during the month of January. During the next four weeks, we’ll be doing some decluttering prep work, nailing down our planning tools, and establishing 2 central organizational zones in our home. 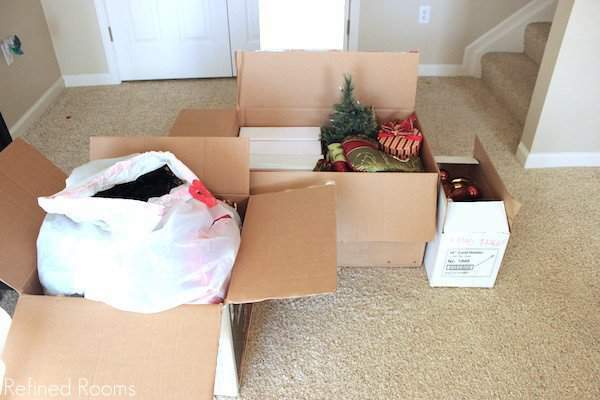 Since much of the work involved with this Challenge involves decluttering spaces in your home, our first order of business is to complete the decluttering prep work. Create a decluttering kit by gathering 5-6 containers that you’ll use consistently for sorting items. 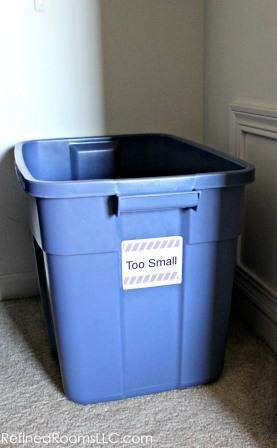 My preference is to use laundry baskets, but you can use regular cardboard boxes, bankers boxes, or plastic storage tubs. Your decluttering kit should also include a set of signs for each of the main sorting categories (Keep, Relocate, Donate, Sell, Trash, Shred, & Recycle). Check out my Decluttering Tool Kit, which contains a set of signs that you can download and use during your decluttering sessions (as well as several other useful resources for decluttering. If you have access to a laminating machine, it’s a good idea to laminate the signs so that you can easily reuse them. When you come across an item in your home that you no longer use or want, where does it go? Every household needs a designated holding place for these “discards”. If you don’t already have a designated place, one of your tasks this week is to set up at least one Donation Station in your home. Some people like to have a box or bin on each floor of their home, while others can get by with one bin. Really, the term donation station is a bit of a misnomer, because you may decide to sell or trash some of these items. I like to use the name because it rhymes, but really it’s for tossing anything that you plan to remove from your home! We have donation stations set up in our master closet and in kids’ closets since we’re constantly purging clothing and shoes. We also have a donation station for general household stuff set up in the corner of our guest room. Eventually, your donation station bins will be full and you’ll need to empty them out. If everything is earmarked for donation, then it’s a simple matter of making a run to the donation center of your choice. If you are planning to sell some of the items in a garage sale, consignment store, or online, you may need a more long-term place to store these items until it’s time to sell. I’m planning to participate in our neighborhood yard sale in May, and I’m setting aside these holiday decorations in my staging area to sell in the yard sale. My staging area for sellable stuff is located in a corner of my basement storage room. If you don’t already have a long-term staging area for sellable items (and you anticipate selling at least some of your discarded items), add this task to your To Do list this week. In my work as a professional organizer, I often found that clients were much more willing to let go of items when they knew they were going to someone who could use the item (and not going into a landfill!). There are countless options for donating, selling, and recycling the stuff you no longer use or love. You may already have a favorite local donation drop off site, such as Goodwill, The Salvation Army, or Habitat Restore. If not, use Donation Town to access an online nationwide directory of local charities who will pick up your donated items for free. There are also non-profit organizations that take specific “niche” donations or that benefit a particular group in need (check out this amazingly comprehensive list of these organizations). Sometimes your donated items can do more good when you use one of these options. Is selling worth the effort and time? My organizing colleague Darla DeMorrow of Heartwork Organizing wrote a thought-provoking post that breaks down the economics of selling vs. donating (it may sway your decision). Options for selling include: Ebay, Craigslist, thredUP, Swap.com, local Facebook buy/sell/trade groups, and consignment stores. There are also plenty of online sites that buy used electronic devices such as Gazelle, Nextworth and USell. My local community publishes an annual Recycling and Reuse Guide that’s an amazing resource for decluttering. It contains a list of all of the local consignment stores and donation centers. It also tells you where to recycle just about anything (old t.v.’s, hazardous waste materials, building materials, etc.). Take a moment this week to see if your community offers a similar resource. It will come in very handy this year! Super cute bench. Is it in a closet or entry?